The boys at Masana have grown to love Roberto and they love the idea of taking swimming lessons with him. For the boys that live at Masana, I pay for their lessons. I also pay for 1 boy who has now gone home to take lessons. But a few boys who are still on the street have decided to save the money they make begging so that they too can take swimming lessons. Swimming lessons cost 400 mets a month which equals about $14. Every day, these little ones bring me 10 or 20 mets to save for them until they have enough to start lessons. Now every afternoon, I load up the car with 8 boys and head to the pool. 3 of those 8 still live on the street and pay for their own swimming lessons with money they make on the street. One of those 3 is going home today. Erson (also known as Robertino, meaning little Roberto, because he too wanted to marry me) has been on the streets for a couple of years. He is a GREAT kid. He helps our cook at Masana every day with washing dishes and things like killing chickens. He is an amazing example to the youngest boys at our project and he really looks out for them. Erson's family lives only about 2 miles from our center. His family loves him and doesn't understand why he doesn't want to live at home. They have said he is welcome to return whenever he wants. During our afternoons together at the swimming pool, I've had the chance to talk to Erson a lot about going home and last week he told me he was ready. We've worked out a plan that I will pay for Erson to continue with his swimming lessons as long as he is living at home, going to school, and doing well with his family. Please pray for Erson these first days as he is back home. Pray that the lure of life on the streets will be removed and that he will love life with his family. Praise God for another life transformed....another boy plucked out of the street life and placed back in a family. Praise God for Erson. I miss being in America on Thanksgiving. It's always been my favorite holiday. The crisp, fall weather and beautiful leaves. A day to gather with family (without the pressure of giving gifts). Delicious food that my mom spends weeks preparing. Writing on the tablecloth the thing I am most grateful for this year. And then at the end of the day, the Christmas decorations start to go up. It's always a beautiful day. But here I am on the other side of the globe where most people have never even heard of Thanksgiving Day. And my day was so very different than it would have been had I been in America. I spent my thanksgiving day with 30-ish street kids at our center, visiting 2 former street boys who are now off the streets and back with their families, and helping one boy begin the process of reuniting with his family. Not the traditional thanksgiving day at all but it certainly was a good day and a day so full of tangible examples of God's faithfulness. Meet the 2 boys I visited and please keep them in your prayers: Joao (above with Glorianne) went back home at the beginning of September. He is living with his father and step-mother and doing so well! Mario (below with Alexis) had been on the streets as long as I have been working with Masana...4 years!! A couple of weeks ago, he got really sick and was hospitalized with malaria. I think his sickness was a wake-up call about the danger and loneliness of life on the streets. When he was released from the hospital, he was ready to go home. Praise God for Joao and Mario and the transformation in their hearts that has brought them to the place that they want a different life. Thank you Father for all of the boys who have made that decision this year and who are today, off the streets and with their families. In 2009, my life was forever changed by the friendship of one of the street boys, Felix. We became the best of friends. Often as I would walk to Masana, I would end up a few yards behind Felix. I always got the biggest kick out of the clothes he wore and the silly games he made up as he walked the streets. A sight I will never forget is Felix in a trench coat and black boots that were way to big for him walking down the street with a large piece of styrofoam that was his "steering wheel" as he weaved in and out of the crowds. In October, 2009, Felix decided to go home. We made the hour and a half drive to his father's house. The months that followed were filled with ups and downs for Felix as he was put in the middle of family issues. One of the hardest home visits I have ever been a part of to this date, was with Felix's grandmother and an uncle. We sat and listened to a family explain that they had given up hope on Felix and that he was no longer welcome to live with them. It was the first time I cried on a visit. I didn't understand how anyone could reject this precious little boy I had come to love. In October 2010, we made the decision to invite Felix to live with us at Masana. We contacted his father and made arrangements for Felix to stay with us during the week and visit family over the weekends. Over the weeks and months that followed, I began to see Felix maturing and growing into a strong young man. Now Felix is respected by all members of his family. It's a joy to watch him interact with the father that he was once afraid of, now full of joy and self-confidence. Last week, Felix turned 15. He is living proof of the impact being in a loving family can have on one's life. Our Masana family is not your traditional family . . . but we are a family. And we serve a God who is a loving Father and who takes joy in setting the lonely in families (Psalm 68:6). Thank you Father for entrusting Felix to our family. Help us to raise him up into the Godly man You have created him to be. May his life always bring glory to Your name. Sadly, A few days after the wedding, Chico decided to return to the streets. His mom called right away and told us he had not returned home. I searched for him many times around the city. He did a good job of hiding from us. I finally found him one Saturday afternoon playing video games with some other street kids. We talked for about 20 minutes with Chico barely making eye contact with me. I reminded him of how much I love him and that God has given him a beautiful family that he needed to return to. After that day, Chico worked even harder to hide from us. No one from my team was able to speak to him for over 2 months. One teammate found him twice and twice Chico ran from him. While I was in the States, I asked people at a couple of churches to pray for Chico to stop running and return to us. A week ago, I returned to Mozambique. When I saw all the boys again, one of my first questions was, "who knows where Chico is staying?" I was given lots of answers and I checked most of them out....the video arcade, Maputo Shopping Center, Mimmo's restaurant, the park in Baixa....but to no avail. I emailed some friends and churches back home and again asked them to pray. Thursday morning, God answered those prayers. Chico stopped running and came to Masana. I cried as I shared with him how much God loves him....that people in America were praying for him to stop running and come back and how faithful God is to answer our prayers. Chico spent the day with us at Masana, had one last night on the streets, and now is back home with his family. Saturday we had a beautiful wedding celebration in Georgia with many of my family and friends. Bob Beckwith, the pastor of the UGA Wesley Foundation, did a beautiful job of sharing about God's faithfulness in giving me the desires of my heart and how His goodness follows us. We had a group of pastors and leaders from the churches and organizations that support our ministry pray over us. And then we enjoyed the spread of food my mom worked so hard to put together. Church weddings in Mozambique are not recognized by the government so we had to schedule a civil wedding with a judge. Many people do both their civil wedding and church wedding/reception on the same day. But we knew the wedding day was going to be really full so we decided to have our civil service a few days before the actual wedding. Guess this means we have 2 wedding anniversaries to celebrate each year....July 16 we were married in the eyes of Mozambique and July 21 we were married in the eyes of God! The civil ceremony was held in a government building. It was all very formal. We had to enter with our godparents, Luis and Lurdes. The judge read the Mozambican laws about marriage. After exchanging our rings, we had to sign the official wedding registry with our godparents also signing as witnesses. Then the judge signed making it all official! 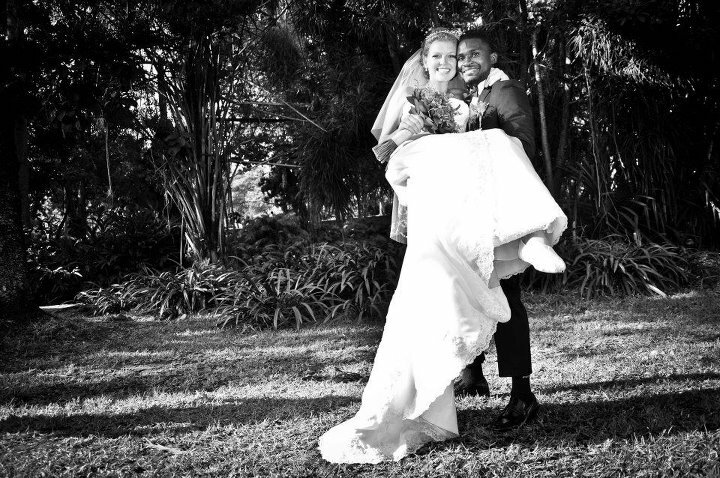 And in the eyes of Mozambique......we were married!!! A wedding in Africa requires an early start. We had 60 chickens, 2 goats, and a rabbit to kill. Not to mention the garlic to peel and crush, peanuts to grind, and vegetables to buy. The feast was organized by the wonderful Mama Julia, our Masana cook with lots of helping hands. Aside from the food, there were decorations to make and boys to get outfitted with cute clothes. Athens Link sent over a suitcase full of clothes for the boys to wear to the wedding. We had a fun day of letting them each pick out their outfit. One of 2 goats given to us for the wedding feast. Luis, our godfather and dear friend, preparing to kill the goat. This is a special chicken that was given to Roberto and I for the wedding day feast. I was not exempt from helping with the chicken kill! Aunts, cousins, neighbors....all singing and dancing as we arrived. This culture is full of singing and dancing! Mom and dad with the rabbit and chicken we were given....they were later killed and prepared for Roberto and I to eat in our new home. The women prepared a wonderful feast for us. Such beautiful women working so hard! Roberto and I were given a capalana, a traditional wrap that serves as a skirt, baby sling, cloth to sit on, blanket.....countless uses! My mom and Roberto's mom. A few of the gifts we were given. The wooden cups were hand made and painted by one of Roberto's uncles. Roberto and I choosing the "special parts" of the goat we wanted to eat....the tongue, stomach, intestines. that's why I've been mia lately. but soon i'll be back to the blogging with some posts about all of our wedding festivities! One of our boys here at Masana has the best luck of finding incredibly cute but silly clothing items as he is out and about on the street. Unfortunitly, part of our boys lives is spent digging through the trash for leftovers, clothes, scraps of metal they can sale, etc. They often show up at Masana with the most random items....ski boots, a broken motorbike for toddlers, broom handles, old tires....just randomness. This one was a great find during our winter months because it's warm! One of our workers was chasing Messi the dinosaur around and accidentally ripped off his tail so I pulled out the needle and thread and poorly attempted to sew the tail back on. Boys like Messi are why I love Masana!!!! Such innocence trapped in a world of street life. Join me in praying for Messi...for the protection of his innocence as he is surrounded by boys who are stealing, drinking, and doing drugs. Pray for him to reach the place that he is ready to leave the streets and go back home to his family. Each month at Masana, we have a different theme for our Bible teaching time. In May, we are focusing on "family." It's no secret that the heart of Masana is to see street kids leaving the streets and returning to their families. We'd love to see the day that the doors to our center closed because there were no longer street kids!!! We were able to kick off our series on family with a Prodigal Son Party for Diogo. These parties have become a tradition around Masana....on the day a boy returns home, we tell the story of the Prodigal Son, give the boy a few gifts, and have a special meal. Diogo had been on the streets for close to 2 years. He is now at home with his mom, siblings, and a great aunt. During his party, we presented him with a shirt, a pair of sandals, and a ring. These are the 3 gifts the father gave his son in the story found in John 15. All 3 symbolize the boy's position as a son in the family. It's our hope that every boy on the streets of Maputo will, like Diogo, realize their position in their families and choose to return home. Please keep Diogo in your prayers as he settles in with his family. Pray that he truly does reassume his position as a beloved son. Last week I had the bitter sweet privilege of taking my sweet Chico home. Chico is 11 years old and has been around Masana for a couple of years. His life on the streets started out a little different. Chico is from a community near the city. He and his friends would come to the city during the day to beg and then return home at night. Eventually they started spending the odd night on the street and then go home the next day. As they became accustom to the freedom of life on the streets, they started going home less and less. Eventually they found themselves living on the streets. With each passing day, it became harder and harder to return home. After about a month of talking with Chico about going home the day finally arrived. I half expected him to change his mind and not show up that day. 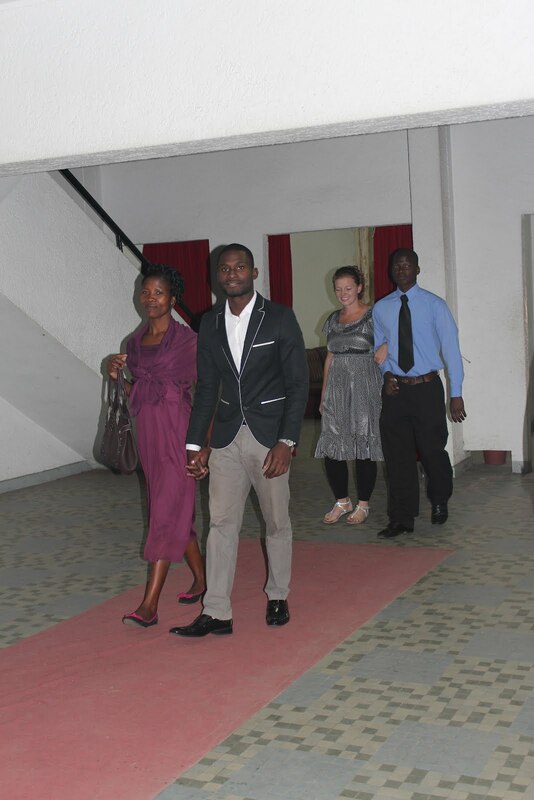 But he arrived at Masana bright and early ready to say his goodbyes and go home. He directed us on how to get to his family's home. Upon our arrival, his mom hug him and his little brother, who was playing at a neighbors, came running too. We sat under a tree with his mom, 2 aunts, and an older, respected neighbor from the community. 8 or more kids gathered around to watch and listen in on our conversation. Chico's mom explained that Chico had never done anything wrong at home but had simply disappeared. She was so grateful to have him back. I already miss my daily hugs from Chico and having him around to hang out after Masana each day. I know I'm not suppose to have favorites but Chico is one of my favorites. Please keep him in your prayers as he readjusts to life at home. Pray against the temptation to return to the streets. Pray for new friends in his community who are not interested in that lifestyle either. Isaac. He will laugh. This is the biblical meaning of the name given to the firstborn son of Abraham and Sarah. Here at Masana, God blessed us with an Issac and, true to his name, he brought much joy and laughter to our home. Isaac grew up on the streets. At the age of 14, he decided it was time to go home. In October of last year, Isaac moved in with us as we began the process of reintegrating him with his family. During this time, we saw him transformed into a young man who knew how to be serious when necessary but also delighted in bringing laughter to those around him. We succeeded in finding Isaac's grandparents in a community near the city but, unfortunately it did not work for him to live there. His grandparents helped us find his other grandmother, his mom's mom. Isaac desperately wanted to reconnect with his mom and live with her. It had been at least 5 years since he had seen her. After many attempts at contacting the grandmother who could lead us to Isaac's mother, we finally met her. 2 weeks ago, she accompanied us on the hour and a half drive from the city to show us where Isaac's mother now lives. Today, Isaac is living with his mother and younger brother. Please keep Isaac in your prayers as he adjusts to this new life. Pray for him to make new friends. Pray for him to be comfortable enough being himself so that he may continue bringing laughter to all he meets.